Beautiful dress.I love the pops of color on it as well.Amazing piece really. You are ADORABLE!!! Cabo cutie!! The colors just say “Life is FUN!” I love the nails too, pops of color just make you smile and you make everyone smile sweet girl! Happy weekend, get some rest and pool time! Sounds like you guys had such a great time! 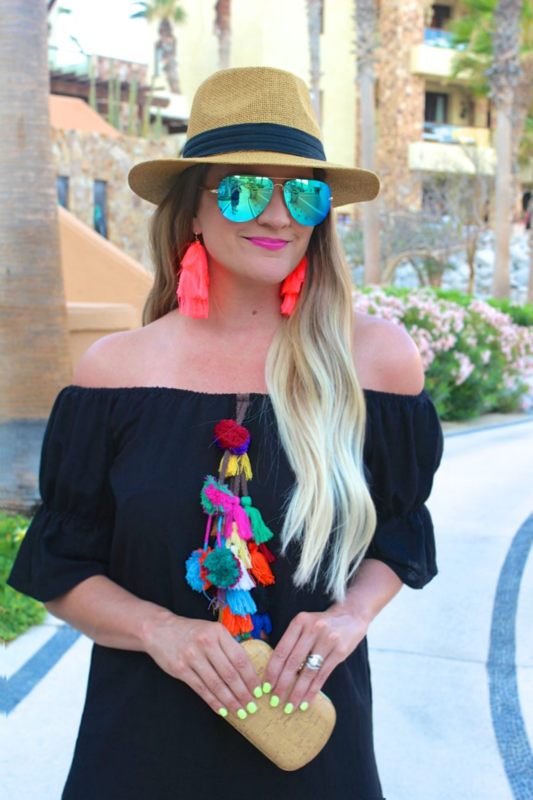 You’re right, this dress is just too perfect for Mexico — I loved all the tassels when I saw it on IG! And yes to your neon nails! I love how they matched the lime in your margarita perfectly 🙂 Hope you guys have a great weekend, Shauna! I love the black backdrop of the dress with all these colorful neon elements! How pretty! This is the perfect dress for Mexico! I hope you had a wonderful trip! Fell in love with this on insta! Completely obsessed with this entire look, even you neon nail polish! LOVE!! I’m loving the tassel detail on this dress and all of your neon accessories. So cute and perfect for Mexico! The tassels are so fun. I love the colors. What a cute summer dress, Shauna! Love the colorful tassels! Always beautiful! OMG those pom pom details are more than perfect for Mexico! You look so amazing in this… Mexico has the best walls, I hope you find them lol! The hardest part of vacation is getting back into the swing of things. I love this dress and the colorful tassels! You are just adorable and love the neon nails too! oh this is so perfect from the nails to the blog title-I love it! What a lovely dress girl, I adore the colors on the front! I haven’t seen anything with pom poms that I didn’t like. This dress is no exception! This looks like the perfect dress to pack for a vacay! I love those pom poms as they add color and fun to the dress! I love getting out of my comfort zone for vacay outfits and this one is fabulous! I love the pops of neon color. You nailed vacation style in Mexico! You look is so fabulous. Have a great vacay. This dress is so pretty! I love these pops of colors! In love with the entire outfit!! So chic!! You are speaking my language! I’m finally starting to get back to my routine after vacation, but it has taken me a good two weeks! I love pairing black with colorful accessories because of the pop of colors. It looks playful and vibrant and fun. These colors though!! So pretty! We are going to Mexico in 2 weeks and I can’t wait!! I have def. found some cute tropical pieces to take along. I just love your nail and pedi color! So vibrant!!! The bright pom poms on this dress make it SO fun! Love your style! What a fun dress! Love the colorful detail. This dress was made for Mexico! Sooo fun! The earrings are a perfect match. Those tassels are so fun! Perfect for a Mexican vacay! So perfect for Mexico! !You look adorable! That dress is the cutest and perfect for your vacation! You look adorable! I love your mani color! I love this dress! The pompoms are so cute! This LBD is the cutest, and such a great pick for vacation! I love those earring too! Seriously. You find the cutest pieces. Oh, yes, this dress is perfect for your trip! Love the colorful pom poms and how terrific your hat looks with this. Thanks for linking up, Shauna!